Collectively, Americans owe $1.3 trillion in student loans. Incredible isn’t it? But what programs are there for students who are liberal arts majors? Unlike nursing, teaching, and medicine where multiple avenues for student loan forgiveness exist, liberal arts majors can find themselves in a tight spot when it comes to loan forgiveness programs. This does not mean there are not options if you look hard enough. The biggest driver of student loan forgiveness for liberal arts majors isn't your degree, but rather your job after graduation. In today’s post, we will discuss some of those options. As a liberal arts major, if you pursue a law degree, there are programs for lawyers you might find helpful. School-based programs : Certain law schools have loan repayment assistance programs (LRAPs) that are not entirely “forgiveness” programs but which will in fact help you in paying back your loans in ways that match your income as a lawyer. Over 100 law school across the United States offer LRAPs. These assistance programs provide you with free money that you can put towards the repayment of your loans granted you meet certain criteria including making an income that is below a certain amount. You will find a list of schools providing LRAPs here. State-Based Programs: Many states offer student loan repayment assistance to lawyers if you practice law in certain areas, or work as a public defender. Learn more about state-based student loan forgiveness programs here. Public Service Forgiveness Program (PSLF) is a forgiveness progeam that forgives the remainder of your Direct Loans once you have made 120 monthly payments on your loan while working for a qualifying employer. A qualifying employer includes working for government organizations, non-profits, Peace corps or Americorps all fall under this category. If you think this is a program that would benefit you, you should fill out this form as soon as you can. The 120 qualifying payments do not have to be consecutive - an example would be if you were at one point working for an organization that was not considered a qualifying employer. You however need to reach 120 qualifying payments with a qualifying employer to be eligible. Didn’t take the law school route ? No problem. There are still programs available to liberal arts majors who pursue employment with non-profit organizations. The top way public service employees get student loan forgiveness is through Public Service Loan Forgiveness (PSLF). You can learn more about PSLF specifically here. While the PSLF is the biggest program that still supports people who go to work at non-profits, you can also tap into programs like Federal Perkins Loan Cancellation. Under the Federal Perkins Loan Cancellation program, as long as you qualify, up to 100% of your loan can be cancelled over a period of 5 years. Under a qualifying profession, 15% of your student loan will be cancelled in years 1 and 2. 20% of your remaining loans will be cancelled in years 3 and 4 of service and the remaining 30% will be forgiven in the fifth year. To participate in the program, you have to get in touch directly with the bursar’s office or financial aid office of the college you graduated from. They will provide you with the necessary forms to fill out. Once you have filled these out you will need to provide supporting documentation that you indeed fall into one of the qualifying categories. Make sure to submit the documentation by the school-designated deadline. The approval of your application ultimately lies with your school. In case you do not qualify for the PSLF or the Perkins Loan Cancellation Program, you can look into the Federal Income-driven Repayment Programs. Every income-driven repayment program has student loan forgiveness included in the program if you have any payments that exceed the loan term. Income Based Repayment (IBR): Income based repayment offers student loan forgiveness on any balance remaining after 20 or 25 years of payments under the program. 25 years for loans taken out before July 1, 2014, and 20 years for loans taken out since July 1, 2014. Pay As You Earn (PAYE): PAYE offers student loan forgiveness on any remaining balance after 20 years. Revised Pay As You Earn (RePAYE): RePAYE offers student loan forgiveness in 20 years if you have undergraduate loans, and 25 years if you have graduate or professional school loans. Learn more about RePAYE here. Income-Contingent Repayment (ICR): ICR offers student loan forgiveness for borrowers under the program after 25 years. Of course, because this is income-driven, you need to be below a certain income threshold to qualify. The form to request income-driven repayment can be found on the Federal Student Aid’s website. They report on their website that it takes around 10 minutes to complete the form. ​It sounds like working through some of these programs could be confusing, but it doesn’t have to be. You can sign up for these programs for free at StudentLoans.gov and do it yourself if you want to. If you want help, we recommend Ameritech Financial, a company I’ve personally vetted. They can help you navigate the student loan terrain and help you systematically apply for the programs offered by the Department of Education. If you’re not sure about doing it yourself, then Ameritech can help you find the repayment solution that’s right for you, and potentially restructure your loans so that you can qualify for programs you may not otherwise have qualified for. You can call them at 1-866-863-3870 or check out their website here. Student loans can feel burdensome and especially so for liberal arts majors who may not have a plethora of loan forgiveness programs available to them. You can check out even more ways to access loan repayment programs or forgiveness problems in this post. 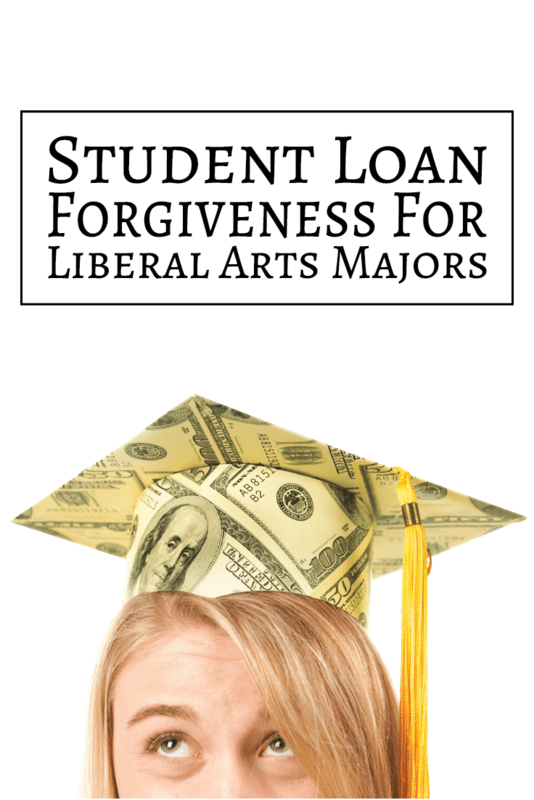 Are you a liberal arts major who has benefited from a loan forgiveness program ? We would love to hear about your experience in the comments.